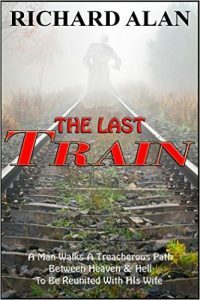 Richard Alan’s Last Train is a short novella about loving couple Jake and Bernadette who are celebrating their silver wedding anniversary when the train they are on is blown up. Jakes dies and goes to heaven where color and emotions are intertwined but as lovely as heaven is to him, being there without Bernadette is simply unbearable. So the first chance he gets, Jake hitches a ride inside of unsuspecting angel and returns to Earth to find his wife and reunite with her. I wanted to like this e-book because I liked the premise but once I started to read the story it felt stale . There were no twists nor a fresh take on this familiar theme that love conquers all even death. It might have been a better novella to me if Alan explored a bit just what it was Jake did that provoked some bad people to bomb the train. Instead Alan stuck to Jake’s singular mission reuniting with Bernadette . The reader through Jake experiences him learning the ropes of being a spirit and finding ways to enter the living as he makes his way closer to to his wife. Yes, there were moments in the novella where Jake faced hurdles. These included Jake witnessing angles fighting demons out of possessed people, escaping angels on the look out for him, and several failed early attempts to communicate with his wife. I do give credit to Alan for adding many lighter moments in the novella and plenty of humor rather than going all dark and dreary. This probably was the lone thing in the book that I appreciated. 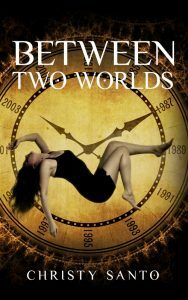 I wish there had been more in this e-book novella I could have liked unfortunately it wasn’t to be.